A movie scene, still photo, or sketch about a tropical place is not complete without a coconut palm (Cocos nucifera) dominating the view. 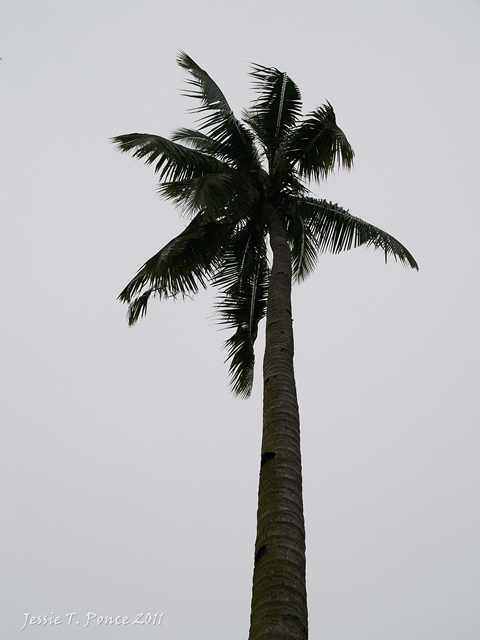 To an outside viewer, the coconut palm is at best just an apt symbol of the tropics but, to the natives of these places, it represents no less than their life. In Sanskrit the coconut is called kalpa vriksha: “the tree which provides all the necessities of life”. In the Malay language, it is pokok seribu guna: “the tree of a thousand uses”. A proverb in the Pacific Islands says that “He who plants a coconut tree plants food and drink, vessels and clothing, a habitation for himself and a heritage for his children.” In the Philippines, the coconut is commonly called the “Tree of Life“. 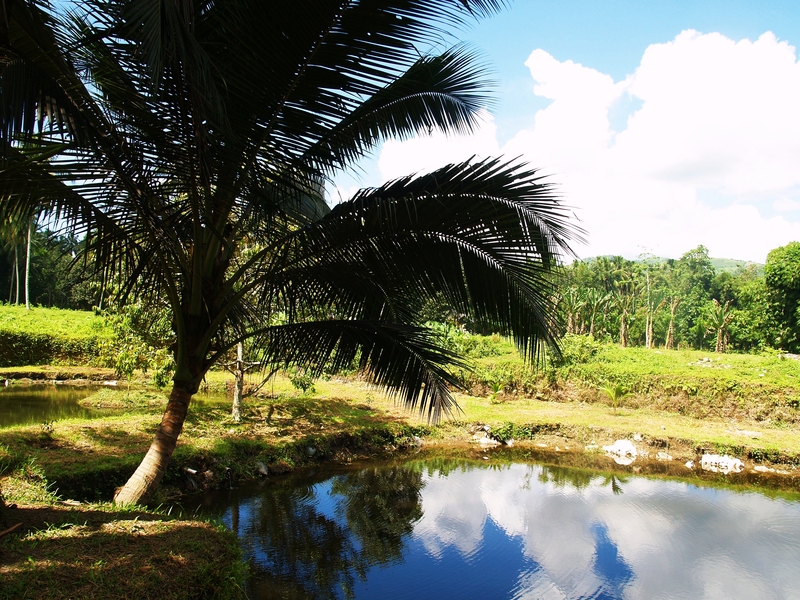 A coconut legend in Guam tells of a young girl who was deeply loved by the whole tribe. The girl became very ill and asked for a special drink that could heal her. Despite the efforts of the tribesmen to search for and give her the first drink; she eventually passed away and was buried on a beautiful spot on top of a hill. The tribesmen noticed a strange plant grow from the girl’s burial ground and they cared for the plant until it grew into a very tall tree. One day, a strange round fruit fell from the tree which they immediately gave to the girl’s mother. The mother asked that the fruit be cracked open then she drank the water collected from the fruit. It was so sweet and refreshing and she knew that this was the special drink that her daughter was looking for. 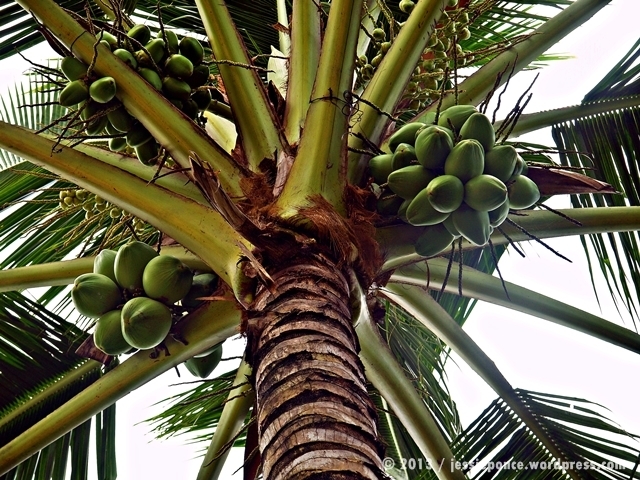 The young green coconut (fruit or seed of the coco palm) or tender coconut is unique as natural refreshment because it offers both food and drink as the Pacific saying pointed out. In many cities in Southeast Asia tender coconuts are sold on the streets, strategic highway stops, and on beaches just like any other fruit. Coconuts are cut in front of customers to ensure its freshness. A portion of the outer husk and shell is cut to expose the fruit’s content. 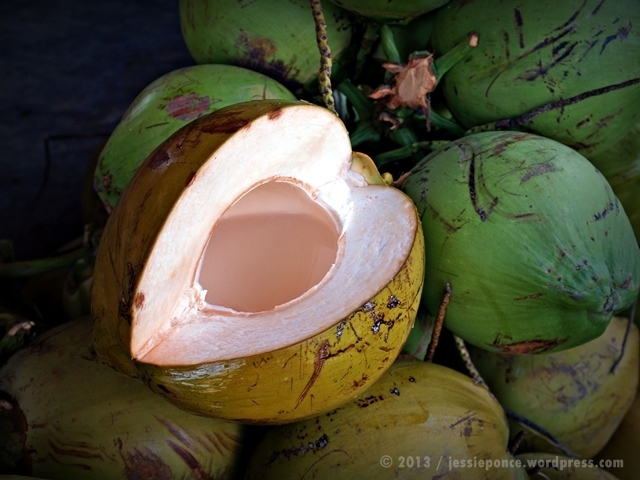 The young coconut meat serves as the food and the coconut water serves as the drink. Coconut water is consumed first by using a straw or by pouring the contents into a glass. The water is mildly sweet with a dash of pungent, aerated feel when cut fresh. Depending on its size a tender contains 300 to 1,000 ml of coconut water. Once the water is consumed, the coconut meat – the white, fleshy, gelatinous part of the coconut – is scraped from the shell then consumed directly or with a mix of sugar or condensed milk. 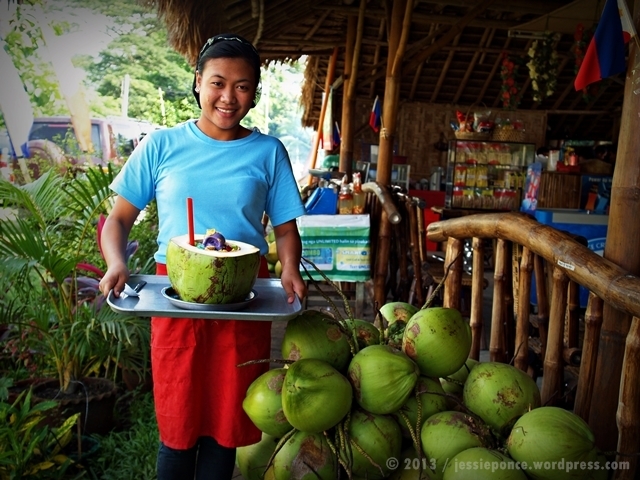 In some parts of the Philippines, for example along the highway of South Cotabato in southern Philippines, the tender coconut is emptied of its water (to be used as a drink later) then filled with halo-halo, a popular Filipino snack/dessert. Most of the ingredients (fruits, beans, and other sweets) are first placed inside the tender coconut, followed by the shaved ice. This is then sprinkled with sugar, and topped with either (or a combination of) leche flan, ube halaya, or ice cream. Evaporated milk is poured into the mixture upon serving. 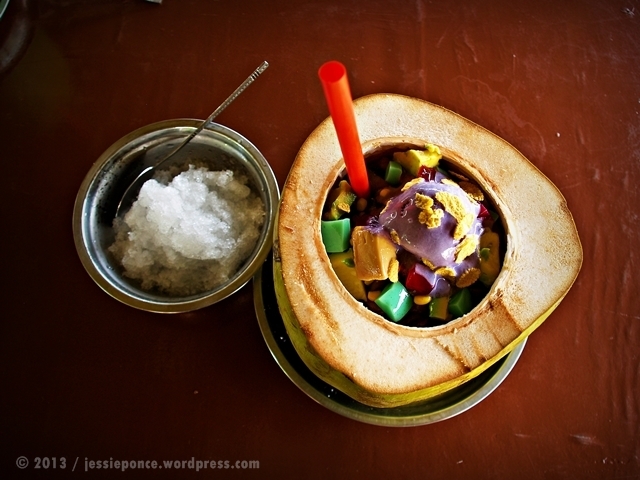 While mixing the halo-halo, the coconut meat is scraped and gets combined with its various ingredients. On the other hand, when prepared for several guests, the coconut meat is arranged like a fruit salad (called buko salad in Filipino). The meat is grated in thin strips then typically combined with the contents of canned a fruit cocktail, sugar palm fruit (kaong), and condensed milk and/or cream then served as a cold snack or desert. About 90% of the fat found in coconut meat is saturated, a proportion exceeding that of foods such as lard, butter, and tallow. Like most nut meats, coconut meat contains less sugar and more protein than popular fruits such as bananas, apples and oranges. It is relatively high in minerals such as iron, phosphorus and zinc. Coconut water contains sugar, fiber, proteins, antioxidants, vitamins and minerals, and provides an isotonic electrolyte balance that can also be considered free of fat and cholesterol. It has high potassium content and contains antioxidants linked to a variety of health benefits. Cytokinins in coconut water may be among its most beneficial components. It is also gaining popularity as isotonic sports drink. There have been cases where coconut water has been used as an intravenous hydration fluid in some developing countries where medical saline was unavailable. Coconut water can be fermented to make a different gelatinous product nata de coco also called coconut gel which likewise often finds its way to the halo-halo. Aside from being consumed fresh, the coconut fruit has various other uses. Coconut water can be processed to create alcohol. Coconut milk (to be distinguished from coconut water) which is extracted from mature coconut meat is part of the daily diet of many people being a dominant ingredient in Southeast Asian cuisines from meat dishes such as the widely popular curry to other fish and vegetable dishes and pastries and desserts like macaroons. Coconut milk can likewise be domestically processed into oil which is commonly used for frying, cooking, making margarine and fuel in rural areas. In the Philippines, coconut milk, known as gata, and grated coconut flakes are used in the preparation of dishes like laing, ginataan, bibingka, ube halaya, pitsi-pitsi, palitaw, buko pie and more. Coconut jam is made by mixing muscovado sugar with coconut milk. 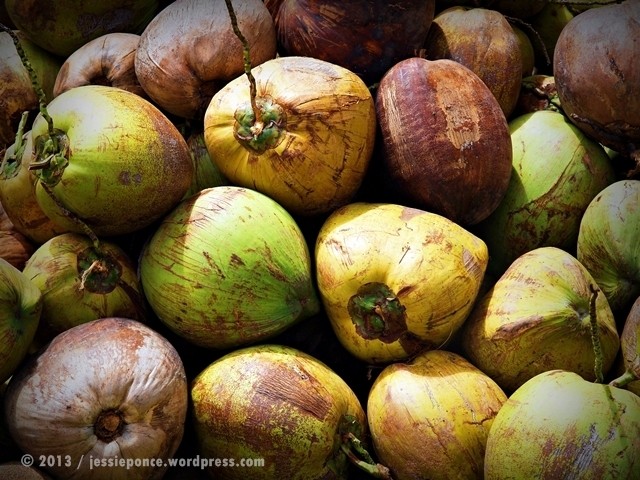 A rare occurrence among coconuts is the sport fruit or macapuno where instead of separate meat and water, the contents of the coconut shell is a gelatinous, somewhat sticky white material which can be sweetened into a macapuno jam. Coconut flour has also been developed for use in baking and to combat malnutrition. Coconut chips have been sold in tourist regions like Hawaii and the Caribbean. Coconut butter is often used to describe solidified coconut oil, but has also been adopted as a name by certain specialty products made out of coconut milk solids or puréed coconut meat and oil. 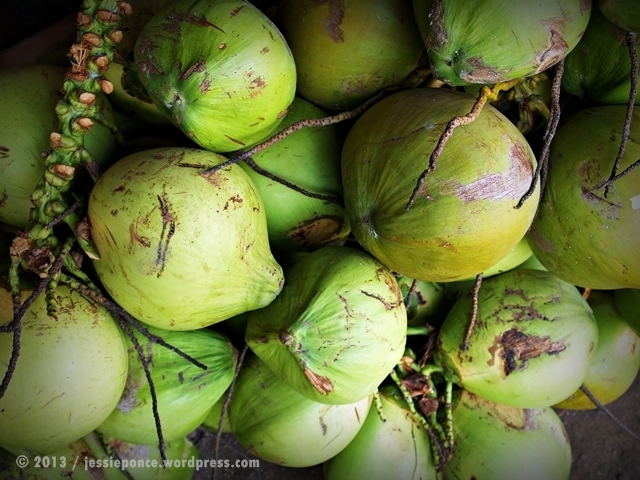 Coconuts may help prevent benign prostatic hyperplasia. The Virgin Coconut Oil (oil extracted from fresh coconut) has recently been gaining popularity as a health product and has various applications in food, medicine, and industry. According to studies with rats, virgin coconut oil reduced total cholesterol, triglycerides, phospholipids, LDL, and VLDL cholesterol levels and increased HDL cholesterol in serum and tissues. The hexane fraction of coconut peel may contain novel anticancer compounds and young coconut juice has estrogen-like characteristics. Coconut flowers bloom in clusters which eventually mature into bunches of between five to thirty fruits depending on coconut variety. In lieu of the fruit, the sap called toddy that can be collected from incising the flower clusters is equally valuable to locals especially among the Pacific islanders. A young well-maintained tree can produce around 300 litres of toddy per year while a forty year old tree may yield around 400 litres. The toddy is drunk as neera also known as tuba (Philippines), tuak (Indonesia and Malaysia) or karewe in Kiribati. When left to ferment on its own, the toddy becomes palm wine which can be distilled to produce arrack. In the Philippines this alcoholic drink is called lambanog or “coconut vodka”. The palm wine can be also fermented to produce coconut vinegar. Furthermore, the toddy can be reduced by boiling to create a sweet syrup or candy such as te kamamai in Kiribati or dhiyaa hakuru and Addu bondi in Maldives. It can be reduced further to yield coconut sugar also referred to as palm sugar or jaggery. The core at the tip of the coconut trunk where the palm stalks grow, the basically very young stalks (Apical buds ) are made of crunchy white material known as “palm cabbage” or heart of palm. 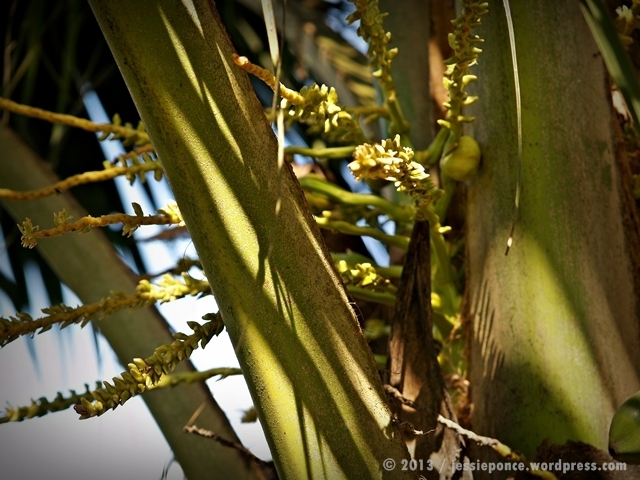 They are edible and considered a rare delicacy as harvesting the buds kills the palms. Hearts of palm are eaten in salads, sometimes called “millionaire’s salad”, fresh spring rolls, or simply treated as another vegetable suitable for cooking with meat dishes. The most common agricultural product from coconut is called copra or dried meat from mature coconut which is processed to industrial grade coconut oil. When the coconut has fully matured and the outer husk has turned brown, it normally falls off from the tree but coconut plantations usually hire harvesters to pick mature coconuts. A full-sized coconut weighs about 1.44 kilograms and it takes around 6000 full-grown coconuts to produce a tonne of copra. In some parts of the world, trained pig-tailed macaques (Old World monkey) are used to harvest coconuts. Training schools for pig-tailed macaques still exist both in southern Thailand, and in the Malaysian state of Kelantan. Competitions are held each year to find the fastest harvester. 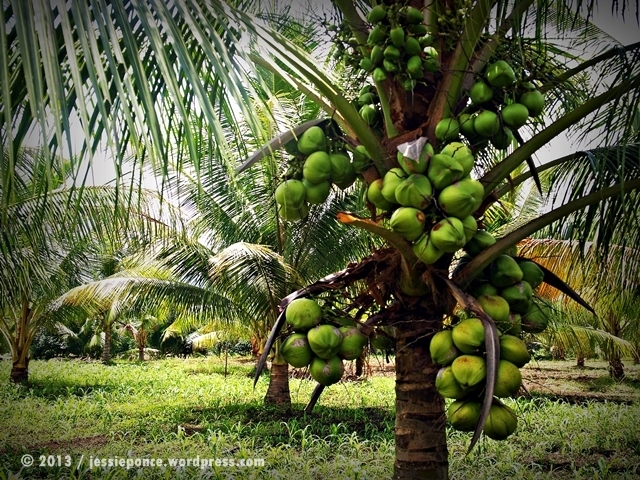 The Philippines was the biggest producer of coconuts in 2009 followed by Indonesia and India. As if these are not enough uses from a single coconut palm; the rest of tree also have their uses in everyday life in the tropics. The coir (the fiber from the husk of the coconut) is used in ropes, mats, brushes, sacks, caulking for boats, stuffing fiber for mattresses, and as potting compost especially in orchid mix. The husk and shells can be used for fuel and are a source of charcoal. A dried halved coconut shell with husk can be used to buff floors, known as a bunot in the Philippines and simply a “coconut brush” in Jamaica. Tempurung as the shell is called in the Malay language can be used as a soup bowl and—if fixed with a handle—a ladle. Coconut shells are also manufactured into various handicrafts, including coconut shell buttons such as those usually found in the Hawaiian Aloha shirts. Certain musical instruments, including the Chinese yehu and banhu, along with the Vietnamese đàn gáo and Arabo-Turkic rebab; have bodies made out of coconut shell. In the Philippines, dried half shells are also used as a music instrument in a folk dance called maglalatik. Foley sound effects imitating the sound of a horse’s hoof-beats often use coconut shells to gain the desired effect. A coconut shell used to grace the desk of U.S. president John F. Kennedy . On it was inscribed an important message sent out from Motor Torpedo Boat PT-109 which he commanded when it got shipwrecked in the Solomon Islands in World War II. The stiff mid-ribs of coconut leaves are used for making brooms in India, Indonesia, Malaysia and the Philippines. The leaves also provide material for baskets and for roofing thatch; they can be woven into mats, cooking skewers, and kindling arrows as well. In India, particularly in Kerala, Karnataka and Tamil Nadu, the woven coconut leaves are used as ‘pandals‘ (temporary sheds) for the marriage functions. Dried coconut leaves can be burned to ash, which can be harvested for lime. Coconut trunks are preferred for building small bridges because of their straightness, strength and salt resistance. Hawaiians hollowed the trunk to form drums, containers, or small canoes. 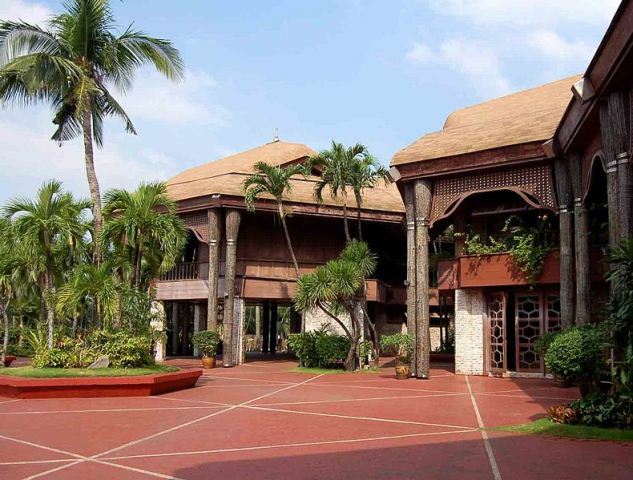 Coconut timber derived from the trunk is increasingly being used as an ecologically sound substitute for endangered hardwoods and has applications in furniture and specialized construction, as notably demonstrated in Manila’s Coconut Palace. In Hindu tradition, a coconut (Sanskrit: narikela) is an essential element of the rituals . The Hindu goddess of well-being and wealth, Lakshmi, is often shown holding a coconut. Coconut flowers are auspicious symbols and are fixtures at Hindu and Buddhist weddings and other important occasions. In Kerala, coconut flowers must be present during a marriage ceremony. Similarly in Sri Lanka coconut flowers, standing in brass urns, are placed in prominent positions during wedding ceremonies. In tantric practices, coconuts are sometimes used as substitutes for human skulls. 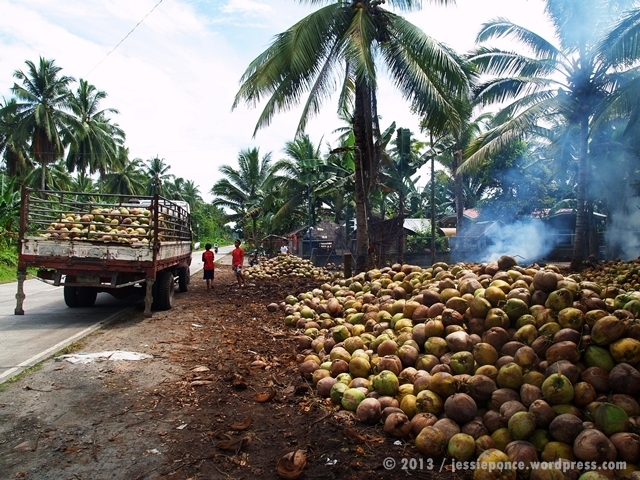 Categories: Tropical Fruits | Tags: Coconut, coconut juice, coconut meat, coconut tree, Coconut water, coconuts in the Philippines, cocos nucifera, Jessie T. Ponce Photography, Pacific Islands, South Cotabato, Tree of Life | Permalink. Welcome to the Contemplations of a Restless Mind. Jessie T. Ponce is the writer (or aspiring writer) side of the Shutter Bug, the photographer. This site contains the short stories, essays and other tales of Shutter Bug in a narrative form. Thank you for visiting and please leave a comment.